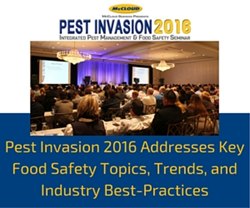 McCloud Services, a leading pest management company headquartered in South Elgin, Ill., hosted its annual Pest Invasion premier food industry pest management seminar on April 26, 2016 at the Drury Lane Convention Center in Oakbrook Terrace, Ill. The seminar was attended by over 300 pest management, environmental health, and food safety professionals; and featured a variety of top speakers. As one of the few pest management seminars with a focus entirely on the food industry, McCloud Services announced some key takeaways from the successful event. The central theme of Pest Invasion 2016 revolved around food safety. Experts presented information on exclusion and sanitation, important components of a food safety program and pest management. Speakers addressed rodents and cockroaches as vectors of disease and threats to food safety. Invited speakers included Mr. Rod Wheeler of The Global Defense Institute; Dr. Matt Frye of the New York State IPM Program at Cornell University; Dr. Hal King of Public Health Innovations, LLC; Mr. Joe Barile of Bayer Environmental; and Dr. Robert Brackett of Illinois Institute of Technology. Panel members included Mr. Wheeler, Dr. Frye, Mr. Barile, Mr. Dave Colbert of Global Materials Technologies, and Mr. Ray Olschewski of Bird Barrier America, Inc. In his talk “Food Defense Roadmap of the Future,” Mr. Rod Wheeler discussed people as being one of the biggest risks to food safety and the people who produce food. Site vulnerability, cyber security, and product theft all put the food supply at risk. Mr. Wheeler recommends that all employees and vendors (particularly pest management professionals) always be on the watch for suspicious activity and report anything that looks unusual. Dr. Matt Frye welcomed attendees into the rodent world in his talk, “Harboring Secrets: Parasites and Pathogens of NYC Rats.” Identification is key to ridding any infestations, particularly rats, so it’s vital to know the difference in appearance, droppings, and gnaw marks between rats and mice. Also important is assessing the size of the infestation (there are typically 8 rats for each burrow hole), how dynamic their environment is (a playground that sees constant action as opposed to a static crawl space), and the population’s food preference (which is actually determined by what the mother ate). Dr. Frye also reports that the risk from parasites that rats carry has increased. In 1925, there was 0.22 fleas/rat but in 2014 that number has increased to 4.1 fleas/rat. o Mr. Joe Barile discussed the multi-faceted value of pest-proofing for pest professionals focused on integrated pest management. Dr. Frye focused on rodent exclusion, and how there is a lot of research to be done on the best methods out there, but basic sealing can and should be done regularly. o Mr. Dave Colbert discussed pest-proofing in grocery stores and identified some of the markets that are lacking but need good pest-proofing, such as museums, schools, and medical facilities. o Mr. Ray Olschewski focused his segment on using exclusion for urban bird control. o Mr. Rod Wheeler joined the panel to answer questions that were submitted earlier as well as questions from the audience. The panel made recommendations for choosing a sealant, how light installation impacts pest management and personnel safety, and vegetation management. In “Active Managerial Control: Implementing Food Safety Management Systems in a Food Retail Business,” Dr. Hal King focused on the need for systematic procedures in protecting consumers from foodborne illness outbreaks in restaurants. Dr. King shared that proper implementation starts with a commitment from the top down that produces systems that are specifically trained upon in a facility with food flow that supports the systems that were designed. Verification and self-assessment is a vital part of the process, allowing managers to identify gaps in the system and increase training to ensure proper execution of the system. German and American cockroaches took center-stage in Mr. Joe Barile’s talk, “Domestic and Peridomestic Cockroach Species of the United States and Their Control.” Cockroach numbers are increasing, but chemical availability is decreasing due to regulatory registration requirements. PMPs need to be more aggressive in their monitoring and diagnostics and “think small.” Mr. Barile introduced MaxForce Impact, Bayer’s cockroach bait with none of the Big 8 Allergens as ingredients, discussed bait aversion, the importance of removing old bait, rotating baits, using bait stations, and using dusts, which make the cockroach’s habitat uninhabitable. While Germans and Americans continue to be the focus, the Turkestan Cockroach, a high desert cockroach found in warm and dry environments, is a new species to be on the lookout for. Dr. Robert Brackett emphasized the need for a food safety culture in his talk, “The Role of Sanitation in Preventative Food Safety Programs.” The lack of a food safety culture leads to red flags for auditing bodies, resulting in them checking and scrutinizing the facility more often than they may have otherwise. The culture is the result of food safety behavior based off of shared values held by all employees of the company. Employees of a company with a food safety culture actively try to find food safety issues, as opposed to avoiding them or running into them when they become a problem. A lack of sanitation preventative controls results in pathogens transferred from cross-contamination, exposure to pathogens in the environment, or food allergen cross-contamination. Strict documentation, training, and execution of sanitation preventive controls are essential to keeping the population safe, a population that is living longer and therefore susceptible to foodborne illnesses longer. Click here for more information on conference presentations and handouts.